We already know Barack Obama is the most tech savvy president to have ever stepped foot in the White House, but this just confirms it. On his official visit to Buck House last night, he came bearing a gift for our majesty the Queen. That gift was an Apple iPod, packed full of video of her 2007 visit to the US and a load of tracks from Broadway musicals including Cats, South Pacific and Oklahoma. I hope Obama was short on time – what else would explain this unimpressive iPod content? He may have thought he was welcoming her to the Apple party, but he has in fact been beaten to the punch, by the Queen herself. 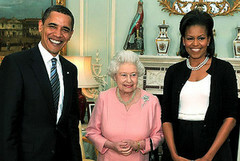 The Queen got herself a silver iPod waaaay back in 2005. I’d like to think she’s upgraded by now, perhaps to the macdaddy of iPods – the iPod Touch? The Queen’s gift gesture was a little less high-tech – it was her traditional gift of a framed photograph of herself and Prince Phillip (who, if I’m not mistaken put his foot in when being introduced).